Commodification tendencies across higher education systems trigger an alarm of independent education being threatened by the labour market and its current needs. The publication ‘Bologna With Student Eyes 2018’ (BWSE2018) -issued by the European Students’ Union (ESU)- presented some results on this matter from the point of view of the students. 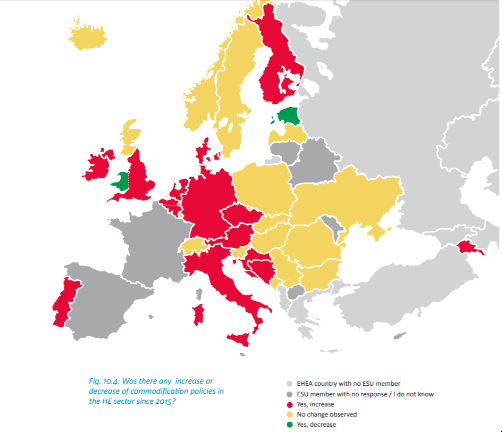 National students’ unions (NUSes) from all over Europe more and more often report cases of commodification tendencies arising at different levels within their educational systems. More than 50% of the NUSes who participated in the survey for ‘Bologna With Student Eyes 2018’ publication claimed there has been an increase in tuition fees from 2015 to 2017 on an institutional level. Students observe two main aspects regarding commodification practices across higher education systems. Firstly, tuition fees are related to the perception and practice of commodification. Students from non-EU/EEA countries are not being treated equally compared to EU-students when it comes to tuition fees, being the first ones paying much higher fees than the second ones. This is an example of commodification by governments and HEI officials who perceive foreign students as customers that can be used to create financial resources for underfunded higher education systems. However, this is not an issue related to these students only, but also to students in general, who are being exposed to a rise in tuition fees. This tendency is building the wrong perception that education is a matter of business and one can even make a profit out of education. The driving force of this perception is a lack of public funding and a misunderstanding of the fact that the role of education is of benefit for the society as a whole. This vision is also reflected in the proliferation of loan schemes for students instead of grant systems, thereby encouraging students to perceive taking financial help as a “private investment” rather than a necessary prerequisite for the right to education. Another example of commodification practices is understanding education as a commodity that can be sold to students abroad for the purpose of making a profit. In the large majority of European states, the number of students is lowering every year and HEIs are implementing strategies to attract more students from other countries. Internationalisation is perceived, from this point of view, as a method to attract more students, and not necessary to deepen the international perspective of the universities. In this process, Internationalisation at home is vitiated as the purpose of students abroad is to gain profit for HEIs, and in some countries, to create additional financial resources for covering the same study programmes in the country’s official language. Prioritizing “competitiveness” of HEIs by governments and HEI leadership, combined with an underfunded system, can lead to an unwarranted influence of corporations on academic institutions, therefore academic autonomy and freedom of research and education can be endangered. This approach is not an appropriate reaction to internationalisation. Secondly, the sole linkage of education to the labour market and at the same time, governments prioritising market-oriented demands to certain student profiles and study fields, prevents embracing the multiple purposes of education. National economic policies limiting the number of places in study programmes are taking place in several countries. Students and graduates are often seen just as human capital serving the purposes of employers and the labour market, undermining the importance of free access to education and the value of education for individuals and society. In some cases, there are certain procedures in HEIs public funding patterns connected with the number of graduates not being employed straight away after graduation. Unfortunately, some states do not assume that they have the mission of developing the potentials of the population through education, in order to increase the well-being of society. This can only be achieved through free access to education and adequate support for students in difficulty. The commodification process is a regress in the development of access to education for the population. Let’s just think about the financial impact of introducing primary education free of charge. This was enormous, but the long-term benefits of the states were inestimable. The next logical step would be for higher education to become free for as many students as possible. After severe cuts to student support systems following the 2008 financial crisis, the first signs of progress and increase in funding are visible. However, a worrying trend of increasing or establishing tuition fees is still haunting the students of Europe. Despite repeated commitments by governments to provide affordable and sufficiently funded education that truly serves as a public and accessible good, there are still gaps in accessibility across Europe. Most worryingly, financial support systems for students do not seem to keep up with increasing living costs. This has resulted in an increasing amount of students taking loans or seeking part- or full-time employment to support themselves during studies – this is not a sustainable trend that would be conducive to concentrating on studies. Linking education solely to the needs of the labour market is on the rise, and is harming the multiple purposes of education for individuals and for the entire society. Free higher education must be seen as an indispensable pillar for shaping the future. As such, Europe should see free higher education as a high-priority goal. Students must be given adequate support through publicly funded grant systems. Student support through grant systems must be preferred over re-payable support systems. Governments must review and adjust students support systems to ensure access to higher education and to guarantee acceptable living conditions during their studies. Governments and HEIs must discontinue discriminatory practices regarding study fees, such as enforcing mandatory fees for international students. These practices are counterproductive with regard to internationalisation. Governments must stop implementing education restrictions based on national economic policies, and ensure accessible higher education for all without the labour market being the main player in higher education policies.